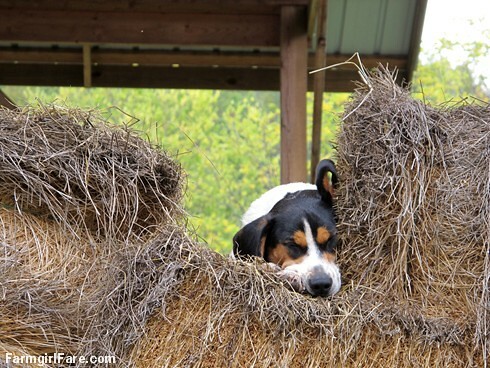 Farmgirl Fare: Sunday Dose of Cute: Ready for Monday? And the whole picture. . .
© FarmgirlFare.com, always above the fray, but not always completely sure what day of the week it actually is. That's a cute dog. How did he get up that high? That close-up shot with his curled up ear tempts me to kiss the computer screen! We love Bert! That haystack is looking a little shaky---I would hate to see his special spot dismantle---especially if he is up there! You know who we haven't seen in what-feels-like forever is Marta. She is just hard at work and prettying herself? !